Move over Mr. Schwarzenegger, the rise of the real machines is upon us. From Bruce Dern in Silent Running to Arnold Schwarzenegger in the Terminator series to Will Smith in I Robot, we see Hollywood’s idea of automated mobile machines taking over the work of man, often against our will, it seems, if you believe what such movies portray. But real machines are and will be designed for practical, useful work, not for taking over the world. In fact, in the past decade we have witnessed a wave of intelligent mobile machines introduced into the market, designed specifically to help (or replace) humans in a tremendous number of activities from transporting material about a warehouse to delivering meals in a hospital to defusing bombs. A convergence of improved technologies, such as better batteries, more efficient motors, GPS, RFID and laser guidance systems, and increasingly powerful microcontrollers, has enabled the design of evermore capable automated vehicles. Set-piece robots in manufacturing are not new. What is new are smaller, cost-effective mobile robotic vehicles and assistive machines that assume or assist with many of the more mundane, repetitive, high cost, dangerous tasks normally performed by humans. From the factory floor to the hospital floor, from the carpeted living room to the muddy garden center, new mobile automated electric vehicles designed for lifting, stacking, carting, transporting, and placing abound. By definition, vehicles move, and, hence, require some means to effect movement. In the case of electrically powered vehicles, that is normally an electric motor connected through a gear train to one or more drive wheels or treads. Typically, these vehicles are battery-powered, and some are intelligent enough to go plug themselves in at a charging station when needed. There is an expanding market for such vehicles, the result of a combination of new technology and the desire for “lean and green” adopted by management teams throughout industry. They continuously look for ways in which to eliminate non-value-added costs, labor and overheads. Some studies peg the growth of the mobile robotic vehicle market at about 5% per year. The names applied to the types of vehicles in these studies are many, and include AGV, AGC, unit load vehicles, electric carts, tuggers, pushers, and so on. But, their defining characteristics are mobile, intelligent (in many cases), autonomous and almost exclusively electrically powered. The size of the market for such vehicles could range today to in excess of $750M. The market narrows somewhat when you segregate by load: previous studies separate “Unit Load” vehicles at 10,000 lb (4,500 kg) and under with heavier loads left to the fork truck manufacturers of the world. The category of vehicles of interest here are those designed to handle up to 10,000 lb (4,500 kg). These machines range from the simple material handling “robots” that may cost less than $1,000 to fully-automated AGVs costing in excess of $50,000. But, even a range of 100 lb (45 kg) to 10,000 lb (4,500 kg) is too broad when considering workloads handled by one, two or a few humans. Typical examples of this type of workload are construction site material movement; stock room product handling; and hospital tasks like patient transportation and handling, delivering meals, linens or medications, or moving heavy diagnostic equipment. Such tasks can usually be handled by vehicles rated for loads up to about 2,000 lb (900 kg). We’ll look at electrically-powered vehicles in this load class of about 100 lb (45 kg) up to 2,000 lb (900 kg), and in particular the types of propulsion systems used in them, including fully integrated traction drive systems. This concept was actually first introduced more than a century ago for use in automobiles. Recent technology advancements have made in-wheel propulsion drives a viable alternative for applications requiring a compact, quiet solution. 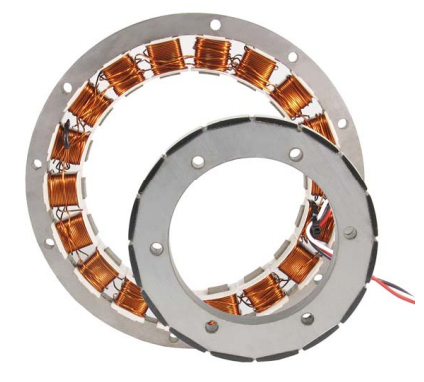 This type of drive system consists of an electric motor designed to fit within the confines of a vehicle’s wheel rim. The rotating component of the motor is directly integrated into the rim and applies torque directly to the wheel. Without any mechanical advantage (gearing), the motor needs to produce higher torque levels than geared solutions, and do it at relatively lower speeds. Unless the motor is properly designed, it will have poor efficiency in the typical operating range for direct-drive, in-wheel solutions. Torque motors like Allied Motion’s Megaflux series are generally the preferred choice for in-wheel designs. Component count is significantly less than other solutions because no gear trains are used. This means, too, that efficiency can be better because there’s no gear power loss. Efficiencies up to 80% and better have been realized with in-wheel propulsion systems. High efficiency is, of course, very important for battery-powered vehicles. In-wheel solutions can also result in more compact, spacesaving designs than other approaches. And, finally, where low audible noise is an issue, no other solution beats the direct-drive design. Challenges remain for direct-drive, in-wheel solutions, however: The high torque motors required are more expensive than traditional electric motors, and may even be more expensive compared to a motor and drivetrain combination that produces the same performance. Also, an in-wheel motor is exposed to the same environment as the wheel, itself, so care must be taken to engineer-in adequate protection. Off-wheel designs, where one or more electric motors transmit power to the drive wheels through a drivetrain, are currently more common than in-wheel designs. The most common drivetrains used include belt and pulley, chain and sprocket, and various types of gearboxes. Some designs use a combination of these. Off-wheel designs do have advantages compared to in-wheel designs: There are more package size and configuration options available because there aren’t the space constraints of an in-wheel design to deal with. A smaller diameter wheel is possible, where an appropriately-sized direct-drive motor design typically dictates a larger wheel size. It’s generally much easier to add accessories to off-wheel motors such as encoders, holding brakes, and integrated electronic drives. And, finally, the vehicle frame may offer protection for the motor, electronics and drivetrain from a harsh environment. 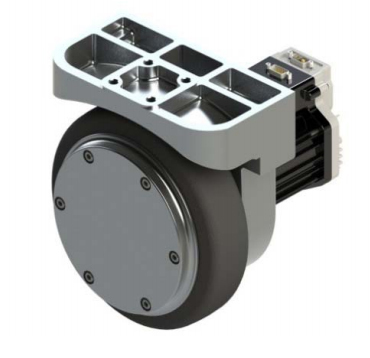 In addition to the Megaflux direct-drive torque motors, Allied Motion has recently introduced a new integrated electric drive wheel product called the WheelMax series. The Wheel Drive offers benefits similar to those of an in-wheel, direct-drive design, but, in fact, is an off-wheel design. The first available model is the WD-1000, which is rated for up to 1,000 pounds (454 kg) load carrying capacity. The WD-1000 incorporates an Allied Motion brushless DC EnduraMax motor coupled to the wheel through an efficient two-stage helical, epicyclic gearbox that is integral to the wheel drive’s housing. A six-, eight- or 10-inch neoprene tire completes the assembly. Gear design and geometry in this drive wheel have been optimized to reduce noise and vibration, and improve gear life. Units have been life-tested under elevated temperatures and in high impact emergency stop conditions and performed beyond expectations. The WheelMax’s integrated EnduraMax brushless motor includes an integral electronic drive to power the motor and control a holding brake when that option is present. And, of course, there is no need for regular brush replacement with the brushless EnduraMax motor. angles that must be negotiated. There are a number of considerations that need to be taken into account to properly size a wheel drive for an application. Foremost is the total weight of the loaded vehicle and how many drive wheels the vehicle will have. The load to be handled by each wheel drive is then roughly the total weight divided by the number of drive wheels. If unpowered casters are used in addition, the normal load each wheel drive must handle will be less, but not the inertial mass that each wheel drive sees when accelerating. Acceleration torque delivered by the wheel may need to be several times larger than the torque needed to maintain speed or even to climb a ramp. Wheel drive diameter influences the torque level and speed required from the wheel to achieve a given performance level for the vehicle. Larger wheel diameters may be necessary to meet ground clearance and/or speed requirements, and they can provide smoother travel on rough surfaces, but they also require more motor torque. On the plus side, the required motor speed and power are less with a larger diameter wheel. 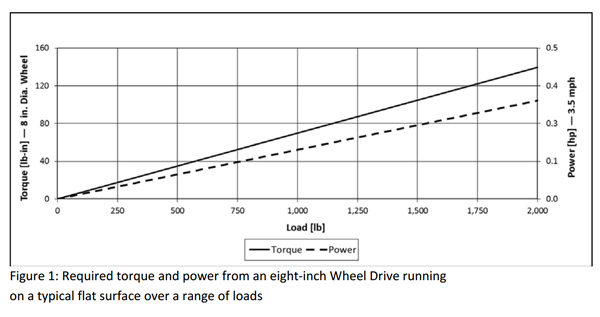 As an example, Figure 1 illustrates the torque and power required of an eight-inch Wheel Drive operating on a flat surface over a range of loads. A full analysis of a wheel drive’s required performance, including peak torque for acceleration and average power needed for typical vehicle travel routines, is needed in order to choose the best wheel drive for an application. The terrain the vehicle will travel must be factored in as well when determining the required motor performance. Vehicles that must negotiate steep inclines or run on surfaces with a high rolling resistance, such as carpet, will require a motor with greater torque capacity. Because of these varying vehicle requirements, Allied Motion offers several wheel drive diameters and ratings. We typically assist our customers in analyzing their application in order to insure that all operating conditions are considered. The result is a wheel drive choice that performs as expected.